Elizabeth C. Hernandez D.P.M. is an attentive and mindful podiatrist practicing in the city of Coral Gables, FL. 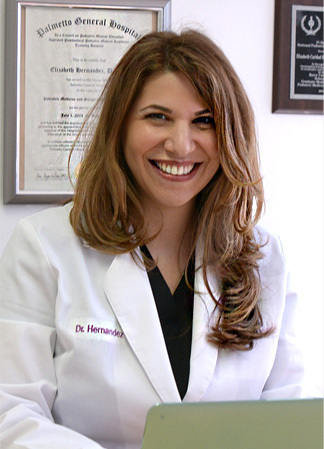 Dr. Hernandez attended Barry University, where she received her podiatric degree and completed her podiatric medicine and surgical residency at Palmetto General hospital. Dr. Hernandez also completed the Ilizarov External Fixation Fellowship in restoration Traumatology and Orthopedic from Kurgan, Russia. Dr. Hernandez is part of Apolo & Hernandez Foot & Ankle Surgery, where she leads the surgical practice. Her areas of clinical expertise focus on total ankle reconstruction, trauma surgery, forefoot surgery, and limb salvage. Dr. Hernandez welcomes patients who require 1st and 2nd opinions. She is committed to helping patients receive the best treatment possible to achieve a positive and fulfilling lifestyle. Dr. Hernandez enjoys spending time with her husband Gene and son Philip. She is a foodie who enjoys traveling and has participated in several medical missions. She is a Native South Floridian of Cuban decent and plays a mean game of dominos.